Our endocrine system is made up of tissues that release hormones into our bloodstream. Whether we like it or not, our hormones control a range of processes: mood, digestion, energy, libido, metabolism and aging. Proper nutrition helps maintain a healthy endocrine system, with specific nutrients playing key roles in regulating your hormone imbalances. If we do not eat food with the nutrients we need, our bodies cannot produce hormones correctly – nor can it maintain hormone balance – because it doesn’t have the proper building blocks to do so. March is National Nutrition Month. Since key nutrients play a specific role in maintaining your endocrine system, now is the perfect time to get (and keep) your endocrine system healthy by eating a balanced diet that is customized to your specific needs. Eating to balance your hormones consists of consuming a balance of macro and micronutrients so that your endocrine system gets the right variety and amounts of the key nutrients needed to produce optimal hormone levels. Phytoestrogens are plant-derived xenoestrogens that are not generated within the endocrine system, but consumed by eating phytoestrogenic plants (also called “dietary estrogens”). Phytoestrogens behave similarly to the estrogen in your body. The role of phytoestrogens remains unclear – they might mimic the presence of estrogen in your system, or phytoestrogens might block the function of the estrogen naturally produced by your body. Eating foods that are rich in phytoestrogens can also help relieve some of your menopause symptoms and may help lower your risk of some conditions associated with menopause. Soy products, oats, yams, broccoli, flaxseed, beans, legumes, carrots and apples all contain phytoestrogens. Insulin is one of the most well-known hormones affected by your diet. When you eat carbohydrates, the glucose from these carbohydrates travels into your bloodstream and triggers your pancreas to release insulin. Insulin then attaches to the glucose molecules and carries them to your cells to be used for energy. Glucagon has the opposite effect of insulin. When you go without eating for an extended period of time, your pancreas will release glucagon which signals your liver to convert stored glycogen into glucose. The sugar is then released into your bloodstream where it serves as an energy source until your body intakes more food. Eating too many calories will cause you to gain weight, no matter what, which raises your risk of insulin resistance and diabetes. So, it is important to only eat as many calories as you burn in a day. If your weight is something that you struggle with, Dr. Mitchell can work with you to develop a custom diet and weight loss plan through our Medi-Weightloss® Program. Your internal clock is the biological process that helps you wake up every morning and gets you to sleep each night. The predominant hormone that preserves this clock is melatonin. When it is dark, your melatonin levels rise and you begin to feel tired. In response to light, melatonin levels decrease so that you feel more awake during the day. B Vitamins (B-5 and B-6) help your brain to continually produce melatonin to support your internal clock. Egg yolks, meats, fish, fortified cereals, grains, dairy and beans are excellent sources of both vitamins. Cortisol, often referred to as the stress hormone, is part of your body’s fight-or-flight response to stress or perceived danger. Though cortisol is vital to your survival during a fight-or-flight response, having chronically high levels of cortisol in your body can increase your stress levels, blood pressure and visceral fat (the fat that surrounds your midsection). Caffeine, alcohol and trans-fats have been shown to cause increases in cortisol secretion. It is important to limit your consumption to keep your cortisol levels in check. Antioxidants can protect cells against free radicals that can cause damage. For optimal health and immune functioning, you should eat the recommended dietary allowance (RDA) of the antioxidant vitamins and minerals. Antioxidants contain compounds that react with the body to limit the excretion of stress hormones (i.e., cortisol). Additionally they help control insulin levels, reduce inflammation, boost your metabolism, support your immune system, reduce bad cholesterol and improve muscle functionality. Apples, blueberries, avocados, spinach, broccoli, dark chocolate, green tea and almonds are high in antioxidants (and yes, we did say chocolate)! 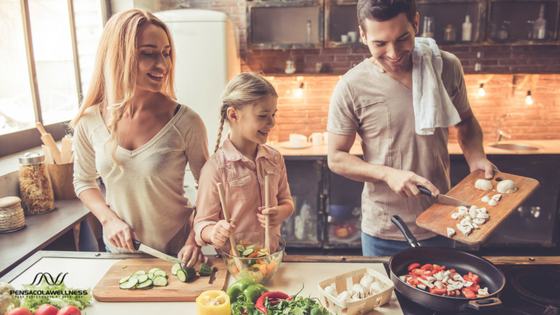 If you’re still concerned about how to eat to keep your endocrine system healthy, Pensacola Wellness offers various lifestyle solutions and resources! For more information on hormones, nutrition and how Pensacola Wellness Solutions can help you achieve hormone balance, contact us today to schedule a consultation!